Well, we finally had the vacation we dreamed about for years: three weeks in Bavaria, western Austria, Venice and Switzerland. This report is about one of the highlights of our trip, an all-too-brief stop at a bauernhof (farm house) in Bavaria. After reading the terrific notes on Bavaria Ben's fabulous website on Bavarian travel, we were looking forward to this. The small town of Maria Gern is just outside of the town of Berchtesgaden, in this region in the southwest corner of Germany. We were looking for another bauernhof recommended by Ben, but were having trouble finding it. Debby (the practical one on our family) saw another place that she thought looked appealing and cute. 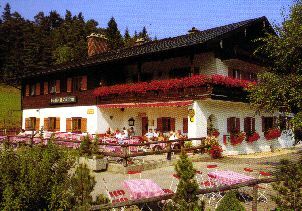 Debby's original feeling about the "Gästehaus Brunnerlehen" was quite correct. The family is that of Franz Stocker, and the house is owned by his in-laws. Franz speaks pretty good English, and he is great host. He filled us in on the events and doings in the area, and some local stories as well. Maria Gern is barely more than a handful of buildings in a cluster (as far as we could see) plus outlying farms and other buildings. The cluster is dominated by a tiny but beautiful church. 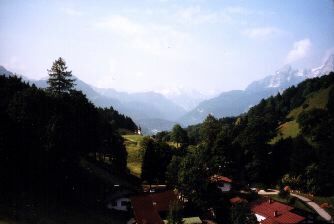 The Brunnerlehen, like a number of other outlying homes in this area, has a gorgeous view of the surrounding mountains. This is the view to the south, as seen from the balcony off our bedroom. At the front door the same view is enjoyed by a few tables outdoor for evening socializing. But we were ready for dinner after a hard day of sightseeing, and asked Franz for suggestions. He asked if we had a kleine hunger, or more of a grosse hunger. We chose the grosse option. 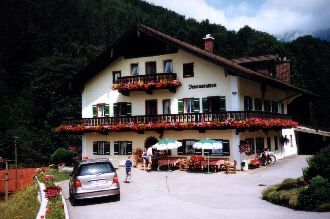 Franz gave us directions up the hill behind us (to the north) to a gasthof and restaurant, Alpengasthof Dürrlehen. The Dürrlehen was a perfect find: way off the usual tourist path (at least it seemed so), friendly, and with delicious food. My wife Debby and I enjoyed a "champignonschnitzel" with our dunkels wheat beers, and our son Chris had spaghetti. This is living! A beautiful setting, great weather, terrific memories in the making, and happy tummies. After dinner, we were just savoring the evening, watching our son play in the playground next to the tables. We noticed a car pull into the most empty parking lot on this Wednesday evening, and a Catholic sister got out. OK, but then other nuns arrived, as did several townspeople with Bavarian dress. Then some priests arrived in full vestments, and then a lot more cars. Within 10 minutes, two dozen cars had arrived and there was a gathering crowd in the parking lot, and more were coming. We asked our waitress what was up. She told us that it was the date for a special summertime local event, a procession to the parish church as a sort of petition for good graces on the town for the summer. Occurring just four times over the season, we just happened to be in the right place at the right time. The waitress had one other piece of advice: she asked if we planned to drive down the hill. When we said yes, she said we should get going, schnell. Once the procession started (in ten minutes) we wouldn't have an easy time getting out! 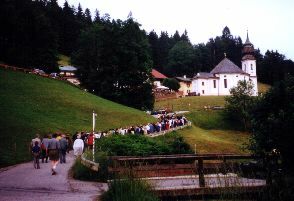 We quickly paid, and made our way down the hill to a point where we could turn out and watch the procession. The route started at the parking lot at the Dürrlehen, down the hill and through the valley. We went to the church as well, and attended the Mass that followed (but we stayed in back) in the tiny church. We were surprised to see how serious this was, in view of the uplifting scenery and the community spirit of the procession. We were also pleasantly surprised to see that our hosts, Franz Stocker and his family, were part of the procedings. When we returned later in the evening, Franz told us how this church at Maria Gern was rather historic, one of three "pilgrimage churches" in the area built about the same time. Though very small, the interior design is surprisingly ornate. The next morning, we enjoyed a breakfast buffet with other guests, and visited with Franz (in the center) and his children, Andreas (in the red cap) and Katerina. 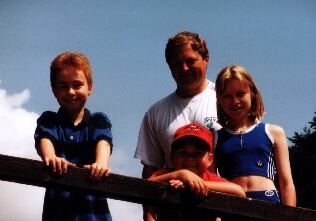 That's our son Chris at the left. Andreas and Chris are the same age. Despite not having a language in common, they quickly found mutual interests: Game Boy, soccer, and riding a skateboard down the easy driveway slope. 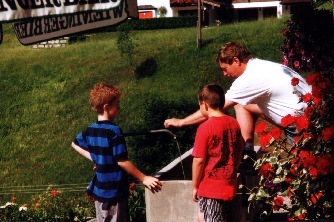 The boys also watched as Franz worked on a project. Our visit to Berchtesgaden really was too brief. When we were there, it was a bit too hazy to consider going to the famous Eagle's Nest nearby. We also found out too late about taking the ferry on the Konigsee. You really missed something not having visited the Konigsee. One day we took the boat over the lake to the very other side, got off and walked around the upper (smaller) lake to the very end of this valley. You can't imagine the beauty of nature when you get there. There is a little mountain hut where you can get a "Brotzeit", like smoked ham, mountain-cheese and dark bread, an milk from goats or cows, all homemade, of course. Then we got back to the ship and got backover the lake, but made a stop halfway back, at the church "St. Bartholom...". It's a wonderful place, too, where all the tourists stop by, but not comparable with the little hut at the other side of the upper lake. Ouch, sounds good and sorry to have missed it. 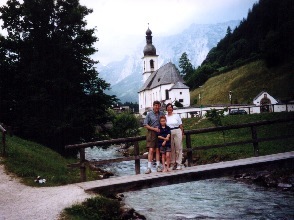 But that's OK, too ... it just encourages our hopes to return someday to Berchtesgaden and the Brunnerlehen! Hi! We made a detour to the Brunnerlehen just to say hello for you folks while we were in BGaden. The older gentleman came to the door from his afternoon nap and was a little confused when we told him we were there to say hello for you. He didn't remember you but the girl came out and asked if you had a little boy and we said yes so she remembered. We asked about the Gasthof Dürrlehen and went up there for lunch. It was just as you had said, I had a plate of Würst mit kraut and potato salad and it was great!